"Oye cómo suena mi bajo, qué rico"
Formell began his historic experiments as Revé's musical director in 1968. He was convinced that he could capture the imagination of Cuba's younger generation by infusing Revé's arrangements with elements of North American rock and roll, creating an odd new style that he called changüí 68 (source). Early the next year, almost exactly a decade after Revé's band had jumped ship to form Ritmo Oriental, and almost exactly two decades before Juan Carlos Alfonso & Co. would themselves leave Revé to form Dan Den, Formell incited the most famous of the Revé mutinies and absconded with the majority of the musicians to form a group which has stayed at the true leading edge of its country's music longer than any other in the history of music -- and which shows no signs of slowing down after nearly 40 years. 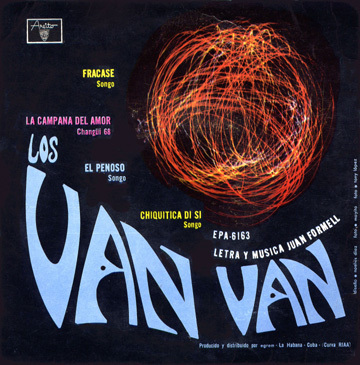 In 1969 Los Van Van released three very popular 4-song EPs, reissued at the end of the year as part of the 12-song LP now available on CD as "Colección: Volume I". At first Formell relied heavily on the songs and stylistic tendencies of his previous work with Revé. The harmonies, never before heard in Cuban music, were clearly borrowed from North American pop -- in some cases rather corny North American pop -- but just as Formell had predicted, Los Van Van captured the imagination of La habana joven and enjoyed huge and immediate success in Cuba. While these early songs now sound almost as dated as the lesser 60s pop tunes that inspired them, their sudden commercial popularity shattered the formulaic limitations on harmony to which Cuban popular music had faithfully adhered for so long, paving the way for the masterpieces that Formell and others were about to create in the early 70s, and ultimately, for the panoramic harmonies of timba. 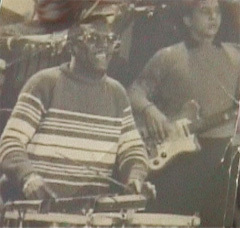 Rhythmically, the 1969 group made the transition from changüí 68 to the first incarnation of a style which Formell called songo. Conguero Raúl "El Yulo" Cárdenas was already in the band, but Van Van's legendary drummer Changuito (José Luis Quintana) had not yet joined begun recording with the group (although there is conflicting anecdotal information that he may have already been playing live with them). The original drummer of Los Van Van - and definitely the drummer of the first LP - was Blas Egües, brother of the late great Aragón flautist Richard Egües.